This is effectively saying that the democratically elected government of President Nicolas Maduro should be overthrown, either by “diplomatic action” or “military intervention.” This bellicose acceptance of an option for military intervention against Venezuela, a OAS Member State, is extremely serious. Such action could involve huge destruction and a massive loss of lives. For comparison, the US’ illegal invasion of Panama in 1989 led not only to the ousting of the government and enormous damage to infrastructure but to 3,000 – 5,000 civilians being killed. Panama’s armed forces were 20,000 strong. The US deployed 27,000 GIs, in a country 15 times smaller than Venezuela, with one tenth of its population. Proportionately, therefore, the levels of destruction and civilian casualties could be frighteningly greater. Almagro’s statement is also serious because calling for the violent overthrow of the government of a Member State violates the OAS Charter, specifically Chapter 1 (Nature and Purposes), Ch. 2 (Principles), Ch. 4 (Fundamental Rights and Duties of States), Ch. 5 (Pacific Settlement of Disputes), and Ch. 7 (Integral Development). These all commit the OAS and its Member States to the principles of respect for the territorial integrity of states, respect for national sovereignty, peaceful settlement of disputes, respect for the right to self-determination, and non-interference in the internal affairs of sovereign states. All of this takes place in a context where talk of removing the elected President Maduro and threats of military intervention against Venezuela are growing under the Trump administration. US ambassador to Colombia, Kevin Whitaker (16 Sept 2018), said that Colombia can count on US support in the event of “Venezuelan aggression against Colombia.” And on 18 Sept 2018, Colombia’s new ambassador to the US, Francisco Santos (brother of former President Santos) also said that “all options must be open to deal with the crisis in Venezuela.” This was tweeted approvingly by Republican Senator Marco Rubio, who himself has invoked the possibility of both a coup and military intervention in Venezuela. 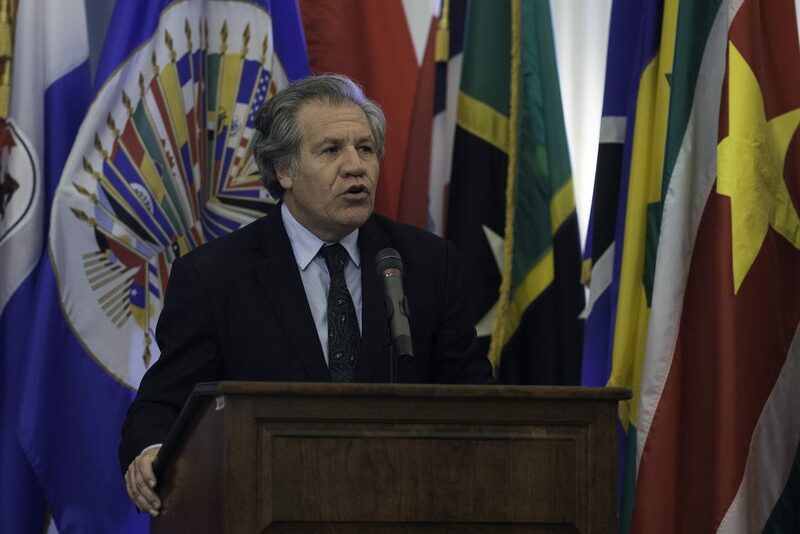 The British government should condemn Luis Almagro’s violation of international law and call for respect for the principles of OAS to which the UK is a permanent observer. All progressive people should reject Luis Almagro’s transgression of the basic principles of the OAS and condemn the calls for military intervention to violently overthrow the elected government of President Maduro.